Futaba Yoshioka is a middle school girl that cannot stand boys. That is the case until she meets Kou Tanaka, and she is immediately smitten with him. Kou moves away before Futuba can really express her feelings for him. Now, she is in high school, and she sees a boy who looks like Kou. But is Kou the same boy she loved in middle school. As Ao Haru Ride, Vol. 4 (Chapters 12 to 15) opens, Futaba wonders what happened between her friend, Yuri Makita, and Kou when they were alone for a few minutes during a study session. Futaba knows that Yuri has a crush on Kou, so she just has to know what happened. When she finally asks Kou, Futaba will learn the history of Kou's family, that includes information about Kou's brother, Yoichi Tanaka (a teacher at their school), and about their late mother. THE LOWDOWN: The Ao Haru Ride manga is a typical high school shojo romantic drama about lovelorn kids. However, there is a little extra beneath the stylish art of this series from creator Io Sakisaka (Strobe Edge; also published by VIZ Media). Ao Haru Ride Graphic Novel Volume 4 delves into the burgeoning love triangle of Futaba, Kou, and Yuri. Creator Io Sakisaka offers beautiful art that softens the edginess between Futaba and her rival in love, Yuri. Ao Haru Ride is so pretty that it might be hard to miss the stubborn determination behind Yuri's doe-like eyes. As usual, I had a blast reading this volume, with Emi Louie-Nishikawa's excellent translation, and I am eager to see where this series is going. 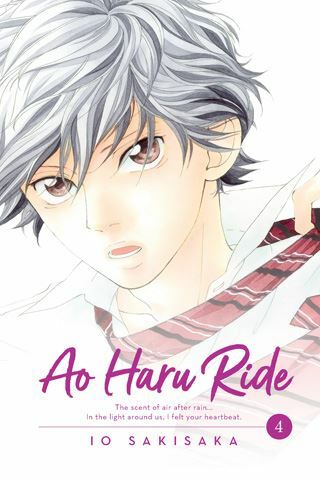 I READS YOU RECOMMENDS: Fans of shojo high school romance will want to read the Shojo Beat series, Ao Haru Ride.